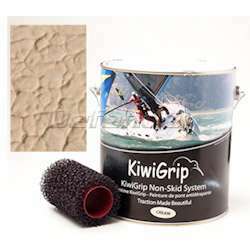 KiwiGrip is a water-based product that will be destroyed if frozen in the can. We try not to ship the product in the wintertime when temperatures are cold enough to freeze. However, if you do purchase KiwiGrip during the cold months we recommend shipping this item by air or pickup at the Defender retail store. If you purchase KiwiGrip from Defender.com and have it shipped between November 15th and March 31st, you are doing so at your own risk. Defender will not be held responsible for damage due to freezing. Please be sure to keep your spare cans of KiwiGrip from freezing so it can be used for repairs and recoats later down the road.